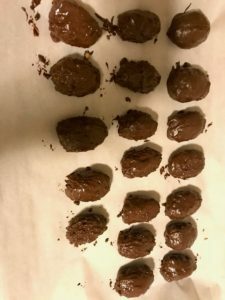 I wasn’t planning to make a recipe for Easter and my only Easter post was going to be the Allergen-Free Easter Candy Review. Last week, I opened Instagram and this beautiful picture was staring at me and I couldn’t resist. I have been meaning to try making one of his recipes and this seemed like a good one to try. A recipe that’s gluten- and dairy-free (we modified it to also make it soy-free)? Check. Few ingredients? Check. Easy to make? Check. If you clicked the link of the picture, I’m sure you’re already salivating. Here’s how to make chocolate peanut butter Easter eggs. 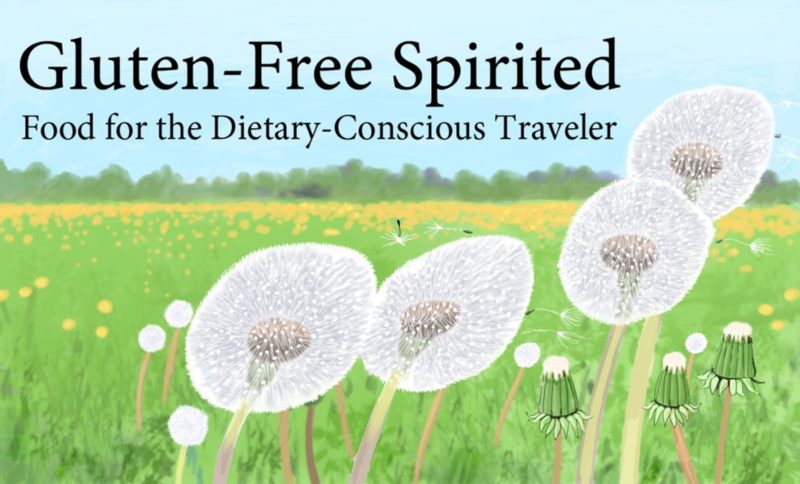 These lovely delights are also vegan, sugar-free, keto, and paleo. Want to make them peanut-free? Arman has you covered! Check out his suggestions here. Note: our recipe is slightly different than Arman’s because we didn’t realize we were low on chocolate chips until we were getting ready to make the recipe. Oops. To find the exact measurements, click on the link above. 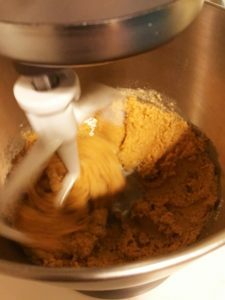 Combine flour, peanut butter, and sweetener. Blend/mix until combined. With slightly damp hands, begin forming mix into dome shapes and places on parchment paper. 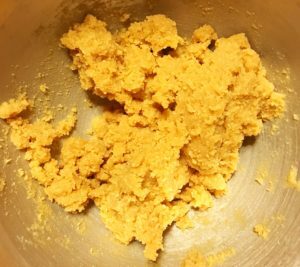 Pro tip #3: We placed mix onto the spoon and formed to shape since it’s shaped like an egg. 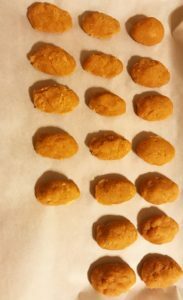 Place peanut butter eggs into the freezer until frozen. We let ours freeze for about an hour. The ones we made first were firmer faster, so we turned the cookie sheet with the newer eggs towards the back of the freezer. They could have probably sat a bit longer. Once frozen, place chocolate chips in bowl to melt. Melt for 1 minute and then an additional 30 seconds as needed. 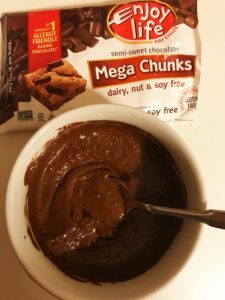 We used Enjoy Life’s Mega Chunks and had to stir them in between. We also stirred afterwards to get it to cool down a bit. Note: Enjoy Life is made with cane sugar, so you may need to find an alternative to keep it sugar-free. 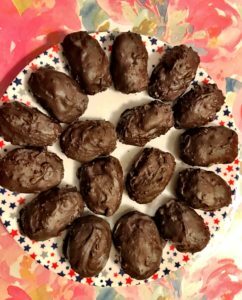 Dip peanut butter eggs in chocolate until completely covered. Place them back onto parchment paper before placing it in the refrigerator to firm until chocolate forms hard shell. Ours were ready in about 30 minutes. Eat these year round as bars and try them with coconut. No one would blame you if you skipped making them into Easter eggs and ate this with a spoon. The first one (top one in the far right corner) was made by hand and the rest were formed with a spoon. Excuse me while I drink this from the bowl. Warning; this was quite a messy job. Inhale at your own risk. 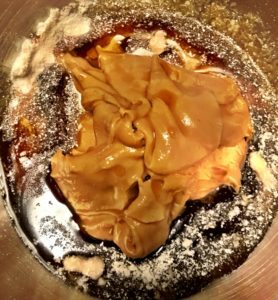 If you enjoyed this recipe, you might also like these homemade recipes: sugar cookies, vegan cheese dip, and birthday cake. As always, sharing is caring. Stay connected by following GFS on social media using the handy buttons below. Be sure to follow Arman too (SO much #foodporn on his Instagram)! Michelle, it was so hard not inhale them! lol I brought 3 to our dad when we went out to dinner the other night and he inhaled them, though he’d say it was so he could give the container back. 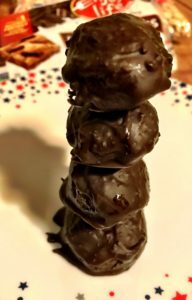 😀 I love chocolate and peanut butter, so I was all about making these. This is a great recipe. The Easter eggs look great and sound really delicious. Oh yum! One of the worlds greated combinations, the mighty PB and chocolate! I love this idea, what a great way for people to enjoy a delicious treat when having allergies – so thoughtful!! One of my favorite combos too, Ithfifi! I was so glad to find this recipe. Nikki isn’t a huge fan of chocolate, but she really liked them. 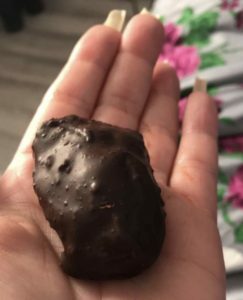 You have all my favorite things named in the title 🙂 Chocolate Peanut Butter Easter Eggs sounds so delicious. I would love to try this recipe, perfect for Easter and my kids would love to help me with this for sure. Preet, I’m right there with you! I love chocolate and peanut butter. Please do let me know if you make it and what the verdict is! Thi looks delicious and easy to make (even for a non baker like me) =). I love the option and creative idea of integrating coconutt for that special flavor. YUM! This looks ABSOLUTELY delicious. I am planning to make some desserts without sugar for myself. This looks like something that can be easily adapted. I think you can find easy substitutes that work for you! These easter eggs sound delicious! I’m not super fan of peanut butter but I’ll check for alternatives! I’m sure you could easily find a substitute. One of Arman’s recipe was similar, except it used coconut instead of peanut butter. These chocolate peanut butter Easter eggs look really delightful. Kids would totally love this for sure. yummy!!! They’re so delicious and easy to make too! We love peanut butter especially my kiddo. These will be included on my dessert list for the weekend gathering. I’m kinda allergic to peanuts though, I realize I break out badly whenever I take peanut. Is there anything else I can replace that with? Oh no, Tiffany! Yes, you can use sunflower butter, cashew butter, or soynut butter. Coconut butter is also an option if you like coconuts. OMG these look unreal and so simple to make!! I might try and make the time to make these next week, they look irresistible! !